Defending winner Fredric Aasbo put in a strong performance Saturday and was running through the elimination ladder toward his first podium of 2019 until an engine failure halted his climb. On Friday, Aasbo qualified tenth, putting him in a corner of the bracket that would see him face down “Rad” Dan Burkett and Ryan Litteral before meeting two-time defending champion James Deane in the Great 8. The head-to-head match with Deane was a fight that brought fans to their feet as the two drivers squared off in a battle decided by inches. Aasbo advanced to the Final 4 to meet Forrest Wang. But as Aasbo rounded the final turn in the first run of that round, the engine dropped one and then two cylinders and the team was forced to concede. 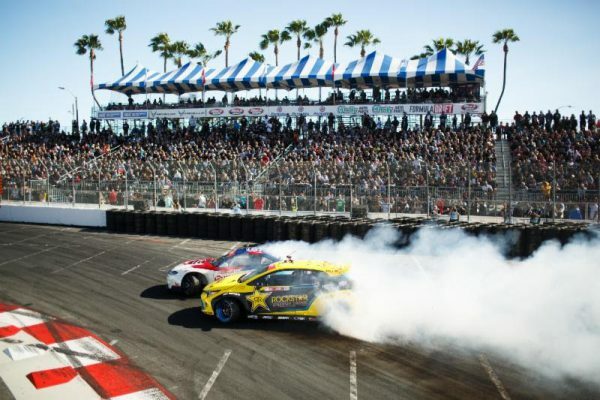 Aasbo had been a favorite to win the Long Beach opener after taking victory there last season on the way to a second-place result in the championship. He scored a total of six podium results in 2018, including two outright wins. Earlier in the day during routine checks, the team had discovered a spark plug that showed signs of unusual wear. They were able to mitigate the effects of the damage for most of the day but fell just short of the final. Papadakis plans to detail the checks, repairs and preparation the team will undertake on his YouTube channel at www.YouTube.com/PapadakisRacing. Papadakis has found a strong audience for his regular content uploads focusing on the technical side of racing and vehicle performance. The channel crossed a significant milestone over the weekend, passing the 100,000 subscriber mark. The team returns to competition April 25 – 27 in Orlando, Florida. ABOUT FREDRIC AASBO: Known for his flat-out style, champion driver Fredric Aasbo has achieved 100-plus podium finishes on three continents over the past decade of competition. He is the most winning driver in Formula Drift history. Aasbo returns to the Formula Drift series in 2019 for a full season in the Rockstar Energy Drink / Nexen Tire Toyota Corolla Hatchback, while also running a select season of events in Europe in the Rockstar Energy Drink / Icom Toyota 86-X, and drifting championship events in Asia. Aasbo made his U.S. debut at a global drifting invitational in 2008 and turned heads as the winner of the 2010 Formula Drift Rookie of the Year title. Since then, he has charged through the drifting ranks around the world and is both a fan favorite and championship winner. Originally from Ski, Norway, Aasbo now splits his time between his native country and Southern California. He campaigns a full international season, with competition stops in the USA, Canada, Europe, and Asia. a solid fourth-place result at the season opening Long Beach event.